The clock with a mechanism with verge escapement, balance regulator and spring-driven movement as well as repeater and alarm is signed on the rear panel by Johann Michael Gugenmus (1705–1775), one of the most outstanding clockmakers active in Warsaw in the third quarter of the 18th century. He arrived in Warsaw in 1743 from Bavaria, which at the time was the centre of clock making, and opened a workshop on Świętojańska Street. His activity coincided with the period when clock making in the Polish capital city flourished. An increase in the number of craftsmen working in that profession led to the establishment of the clockmakers’ guild in 1752. Gugenmus was its co-founder, and the following year he was chosen as the master of the guild. Since the Middle Ages, guilds organised craftsmanship and trade in the city, oversaw the training of disciples and apprentices, as well as the quality of the manufactured items and their prices. Beyond doubt, the establishment of the guild raised the prestige of Warsaw’s clockmakers. Aside from the name of the maker, the rear panel of the clock’s mechanism features two letters: “S. H.”. They stand for the words servitoratus horologi, meaning a clockmaker working for the monarch and excluded from the municipal authority. Gugenmnus was granted this title on 14 March 1765 by King Stanislaus Augustus Poniatowski (1732–1798, King of Poland 1764–1795). As a servitor, he was obliged to act as a custodian of royal clocks and deliver his own products to the royal court. Apart from recognition, it also offered measurable benefits as it paved the way to aristocratic clients. The presented clock is a luxury item that catered for the tastes and needs of very affluent clients. The clockwork is located in a silver repoussé case which, apart from the styled shells – rocaille, also features Hercules, Mars and the goddess of wisdom Athena towering above them. The scene is of an allegorical character – it symbolizes the primacy of reason over force. The intricate case is additionally secured by a holder. The openwork of the bezel and the round openings in the holder offered the possibility to hear the striking on the hour and on the quarter of an hour. This clock type – very popular in the 18th century – was manufactured in many centres. One of the major sites was Friedberg in Bavaria. 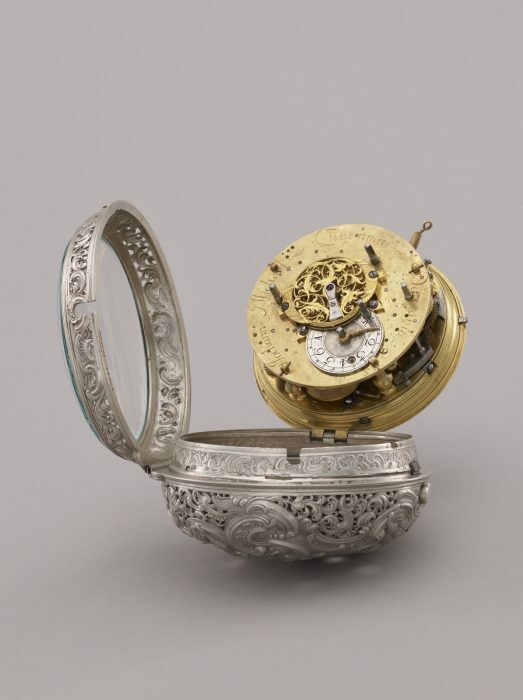 Silver cases were the work of silversmiths, who often did not put their signature on them – as in the case of this clock. The clocks’ repoussé cases were a specialty of workshops in Augsburg, from where they were sent across Europe. The carriage clock was hung inside a carriage. The repeater that struck the hours after the carriage had started moving as along with the alarm facilitated the time control during journeys.